A few days ago I posted A Litany of Prayer for Aleppo. I was and still am heartbroken and overwhelmed, maybe even possessed, by what is happening in Aleppo. 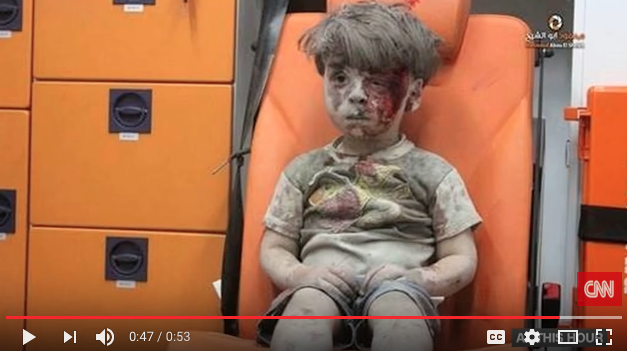 Omran has become for me an icon of that tragedy. His face and silence are ever before me; waiting, questioning, and convicting. I could not not pray. I also know, however, that Aleppo is just a microcosm of what is happening throughout Syria and the world. I thought about the other prayers and litanies I have prepared and offered: for the 10th anniversary of 9/11 (9/2011), for Syria (9/2013), for Ukraine (1/2014) for persecuted peoples and religions (8/2014), for Beirut and Paris (11/2015), for Orlando (6/2016), for Turkey and the world (6/2016), for Istanbul, Bangladesh, and Baghdad (7/2016), for Baton Rouge, Minnesota, and Dallas, (7/2016) for France and Turkey (7/2016), for post-election America (11/2016). The world’s pain seems to outpace my prayers. The faces and places might change but the prayers, the intentions, concerns, and needs, are always the same. I pray for those who have died, for those who grieve, for the suffering, for the injured. I pray for peace, that we might tear down the walls and borders that divide us, that we might love our neighbors as ourselves. I pray that we might not grow weary of caring, become indifferent, or accepting of violence as business as usual. I pray that we might not live in fear, mistrust, and suspicion of the other. I pray for justice, wisdom, and compassion. I pray for forgiveness. I pray for God’s mercy and consolation. I pray for generosity and soft hearts. I pray for the Omrans of the world. I was brushing my teeth when I heard a voice from within. It was not audible to anyone else but it was clear and direct. I heard it. Aleppo needs people of prayer: people willing to let their lives be shaped and reshaped by the words they pray; people willing to take on Christ’s concerns, values, and priorities as their own; people whose words of prayer become flesh. Aleppo needs people who embody the words they pray. If I am not willing to, in some way, enact the words I pray then I should not pray them. In a sense, prayer begins after the words have been offered. “Amen,” let it be, is the beginning not the end of prayer. We must not let the people of Aleppo live and die in the gap between our words of prayer and our prayerful actions. So what will I do? What will you do? How will we enact and embody our prayer? That’s the question each one of us must answer. We will all answer it differently, uniquely, according to our lives and circumstances. In answering this question we come face to face with ourselves and our own sense of powerlessness. What can I do? What difference can one person make? I don’t know, but I know this. That cannot become an excuse. For as Rabbi Tarfon says, “It is not your responsibility to finish the work, but neither are you free to desist from it” (Pirke Avot 2:16). My work, then, is to pray for Aleppo and become the prayer I offer. Thank you for sharing this, Rev. Marsh. I share many of your frustrations and like you, I do not really know what to do. At age 89 my options are limitred. Your ideas are appreciated. And my thanks to Mike Davis for introducing me to your ideas. Jim, I’m glad you found my blog and appreciate your comment. What to do? That’s the question. Whatever it is, it must fit within the circumstances of our own lives and resources. Maybe the first things that come to mind are donating money and volunteering time. Some may be able to do that, others may not. I wonder, though, if we sometimes think too big and limit our possibilities. So maybe it could be writing letters to our elected representatives. i might be reaching out to get to know faith communities different from our own. Maybe it’s telling others about your concerns and inviting them to be concerned and active. It might be refusing to join conversations that are hateful and prejudiced. Maybe this Christmas our gift to friends or family is a donation in their honor to a humanitarian relief organization. Maybe it’s watching the news and seeing the faces of refugees and then remembering times when we too were refugees of life – so that they are not just news stories but people with whom we identity and stands in solidarity. Sometimes all we can do is sit with them, help hold the pain, and weep tears – presence – and that’s enough. We don’t have to be in Syria to do that. We can learn their names, call them by name and sit with them. Thank you for your question and helping me think through this. Mike I’ve just read your reply here after posting below, wish I’d read this before posting thanks. I’m glad my reply was helpful. I also left a reply to your original comment. Thank you for your prayers even when they do not seem to be enough!!!! Thank you Pam. Your comment reminds me of a spiritual director who told me that we cannot judge our prayer. We simply don’t and cannot know. What there is to do is to look in one’s own life and see where I am dropping bombs on others, killing off people around me because they aren’t the way I want them to be, being deaf and blind to suffering, forming alliances against others, making hurt and pain. Thank you, Narelle, for this important and challenging insight. If we want to end the wars around us we must start with the wars within us. Thank you for sharing this reflection and challenge! You put into words some of the struggle I have been experiencing with “just praying” for the ongoing litany of needs in our world. YES! We must become the prayer we pray! The incarnation of God must continue in us… And especially as we celebrate this Christmas Season, God desires to become flesh again – in us! Yes, yes, yes. The incarnation cannot be limited to only Jesus. It must continue in us. “And the Word became flesh and lived among us.” Thank you for your lovely comment. Thanks, John, for your affirmation and presence on my blog. We do this work best in community – maybe it’s the only way we can do it. Yes I completely agree. Thank you, though, for praying anyway and being a person whose life is shaped by prayer. Anne, I appreciate your encouragement and presence. Thank you. Aleppo definitely needs us to become the prayer. Thank you for encouraging us all to do something, no matter how small it may seem, to be as Christ to all who suffer. I’ve just been re-reading the above. Whilst this subject specifically referenced Aleppo the last four paragraphs apply to any prayer at any time and on any topic. This is obvious and we all know this, but do we really? Some may, but I’m not so sure that I always do, I find prayer difficult and so tend to use a lot of prayers that other people have written. Now this does not mean that these prayers are not well written, or that they don’t express the sentiments that I may feel. But reading this has caused me to re-examine my own practice. Surely every time we trot out prayers we devalue our prayer life. A few years ago, this sort of thinking led me to question the frequent use of ‘Liturgy’. I still adhere to the view that frequent/regular use of the same litany leads to ‘parrotry’. “If I am not willing to, in some way, enact the words I pray then I should not pray them.” I can’t argue with what you say but at the moment I’m stuck/lost somewhere in the penultimate and closing paragraphs. I feel somewhat like looking into a mirror and seeing a hypocrite. Much thought and sincere prayer needed. Ernie, thanks for sharing your struggles with and questions about prayer. I understand and know these as well in my own life. I agree, the last few paragraphs of my post are about all prayer and not limited to Aleppo. Prayer is difficult and it does have a mirroring affect. It confronts us with ourselves and our relationships with others as well as God. I don’t see that difficulty and struggle as necessarily being a negative but as our desire for authenticity. And “parrotry” can be an issue with any kind of prayer. I think we sometimes get stuck or lost in prayer when we view it as a goal or an ideal to be achieved, rather than a practice, a way of being and living. In some sense, we are all beginners learning how to pray. Thank you for your words and sentiments! Emily, I’m glad you found my blog and I appreciate you sharing with others the Litany for Aleppo. Thank you also for pointing me to the Litany of Nonviolence. I especially like and am struck by how it focuses on us and the violence within us. There is much to reflect on. May God’s blessing and peace be with you. Merry Christmas.